"What A Difference A Year Makes In The Northern Forest!" 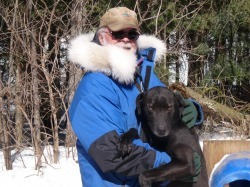 Yes, it is hard to beleave the changes that one year makes in the lives of a sled dog. The above video shows Yaluk and Tepeu on their very first run. Now, one year later both dogs ran three races this year. Tepeu ran one race at lead and two races at Point on Cecile's 6 Dog Team. Yaluk ran her first race at Point in the 6 Dog Team and two races in the first team position on the Open Team. Both of these young dogs showed great potential for their future. Yaluk is very strong and built like her father Willy. Tepeu is a little more refined in her build like her mother Angel. Both dogs are very enthusiastic, smooth and focused when running. Speed is not an issue with them and I feel we haven't yet seen just how fast they are. Whether 6 miles or 15 miles, they don't show fatigue! We have two more dogs that are 6 months younger that are also showing great potential. The female, Yoda, ran her first race at Nicolet in the 6 dog Team. Darth, the male, has finally grown into his body and is proving to be a very fast smooth runner. These four young dogs are going to make a big difference in our teams for next season. Along with the expecting puppies from Blue/Bergen, the future here looks good. This week has been a very quiet week here as we only got in one day of running due too icy trails after the rain on Tuesday night. We got a little snow this morning and the forecast is for more through the night. Hopefully, we will have enough to get the dogs back out running this coming week.